Hotel Islazul Punta la Cueva is a good value choice for anyone looking to visit Cienfuegos, Cuba’s Pearl of the South, particularly if you like beautiful sunsets. Punta la Cueva is conveniently located on the east of Cienfuegos Bay and is only a few minutes from the historic city on foot. There is plenty to do nearby and guests at Punta la Cueva can even take boat trips from the hotel’s own pier, which is especially helpful for guests on diving trips. In addition to its pretty pier, the ideal spot to watch beautiful sunsets, the hotel has a small beach which is shaded by cabanas and palm trees. Punta la Cueva’s accommodation and communal facilities are set among colourful gardens and there is a large swimming pool. The hotel has a bar, nightclub and buffet restaurant serving simple food and drink of good quality and low price. If you are travelling on a budget and want a memorable experience of Cienfuegos, you should find all you need at Islazul Punta la Cueva hotel. The rooms at Punta la Cueva are rather dated, though they are clean & comfortable. All standard rooms are ensuite & have air conditioning, satellite tv & fridge. 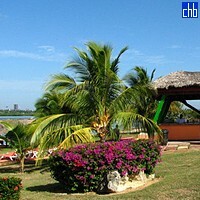 Rancho Luna Beach is located just outside of Cienfuegos. The semicircle-shaped, soft sand and beach is bathed by peaceful and warm waters. There are different diving areas nearby. Its coastal platform is particularly rough and inhabited by a rich marine life; its shallow waters hide beautiful corals that form low and medium depth reefs in the Barreras Cove and in Las Playitas; abrupt underwater geography and abundant sponges, gorgonians and corals are located much deeper and are particularly enticing. Punta La Cueva is sited in the Bahia de Cienfuegos across the water from Cienfuegos City to the West.